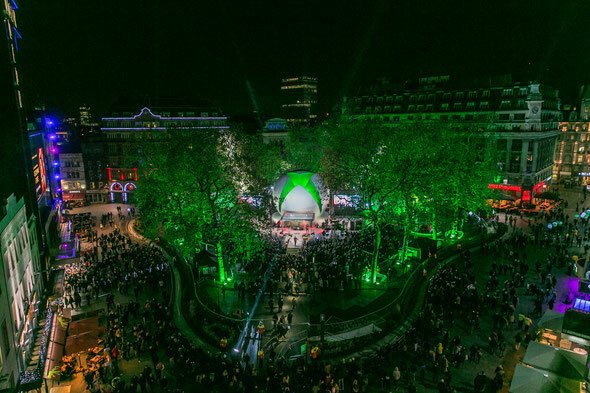 Leicester Square in London, UK officially became Xbox One Square yesterday for the launch of Xbox One. 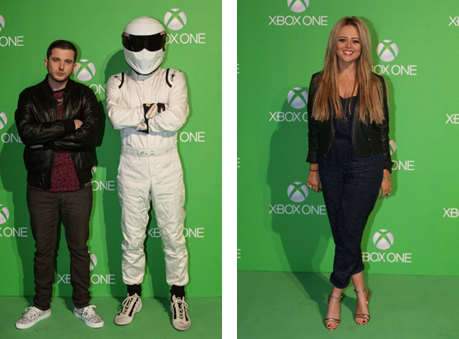 Possibly the biggest week in video game history kicked off with live outdoor performances from chart toppers Plan B and Katy B, and the midnight opening of a pop-up GAME store in a 10,000 ft2 Xbox One gaming zone in London’s Trocadero. Leicester Square came to a standstill as stars from TV, film and music welcomed a new generation in gaming and entertainment, along with thousands of fans. A giant three-dimensional Xbox nexus dominated the centre of Leicester Square, which was transformed into a gaming and entertainment universe for the day. The very best of British game developers – who now represent one of the country’s most successful exports – were also on hand to showcase their new releases. Zombies from Dead Rising 3 roamed the streets alongside a Roman legion from Ryse: Son of Rome. The Stig drove through the crowds in a McLaren supercar from Forza Motorsport 5 with headline performer Plan B, while Premiership footballer Andros Townsend competed against fans on FIFA 14 as part of the two-hour live extravaganza. GAME then opened the doors to its pop-up store in the Xbox One Gaming Zone in The Trocadero. Phil Harrison, Corporate Vice President, Interactive Entertainment Business, Microsoft EMEA, said: “We’re proud and excited that Xbox One is going to be the biggest launch in Xbox history. Xbox One is a complete, all-in-one system which has the best games, the best online service in Xbox Live, the best entertainment experiences and is built for the future. With the strongest line-up of games we’ve ever seen for a new console, pre-orders from fans across the UK are at unprecedented levels. Councillor Robert Davis, Westminster City Council’s deputy leader, said: “Leicester Square is the number one leisure destination in the UK, so Xbox holding their UK launch here is a perfect match – as the console will provide people with hours of fun, film, music and entertainment, just like the West End of London. “Microsoft already has a strong bond with Westminster, with Microsoft Studios’ Soho Productions and developer Lift London just a few hundred metres away in Soho – which is becoming one of the UK’s fastest growing hubs for software designers and programmers. Xbox One goes on sale in the UK today at £429.99 RRP, with launch titles – including Forza Motorsport 5, Dead Rising 3, and Ryse: Son of Rome exclusive to Xbox One alongside FIFA 14, Call of Duty: Ghosts , Battlefield 4 and Assassin’s Creed: Black Flag.